Flat feet, the complete or near-total lack of an arch was once thought to be enough to prohibit people from running. But fortunately for us flat-footed Pheidippides, running shoes have evolved (even if our feet have not). Nowadays, there is quite a wide range of running shoes available in the current market and the following are just for Brooks Adrenaline GTS 14 and Saucony Guide 7. We do comparison only for these two running shoes, because based on the performance and features, both of them seem to have several similarities that make someone is confused enough to make an option. Helping you through this article will be very nice and we hope you like it so much. The materials contain on the uppers of Brooks Adrenaline GTS 14 is breathable mesh with synthetic overlays. It has more overlays around the midfoot, but less overlays on the toe box. This shoe would be the one to give you more room in the toe box. And the crash pad of Brooks Adrenaline GTS 14 is also more segmented towards the midfoot in the Brooks Adrenaline GTS 14. In addition, the Brooks Adrenaline GTS 14 has three densities of foam of progressively increasing hardness to stop probation during the heel-strike to rolling in phase. The power of midsole on this shoe comes from BioMoGo that anatomically laid out Brooks DNA for cushioning. While the outsoles consist of durable rubber under the heel and the forefoot are also well segmented because, it consists of many rubber lugs and flex grooves. The saucony Guide 7 on most overlays are thick and sturdy on shoe. The Saucony Guide 7 lies mainly in the mechanism used to control pronation and in the type of cushioning and have a crash pad on the lateral side under the heel to absorb shock. Since the Saucony Guide 7 has more heel cushioning than the other one, the landing will be softer is debatable. It also has one firm post on the medial side of the midsole to perform the same action and a PowerGrid midsole that provides cushioning, makes you feel softer under your heel and forefoot. About the outsole, Saucony Guide 7 in the forefoot area consists of blown rubber and get extra cushioning from it in the forefoot. Moreover, The Saucony Guide 7 also has strategically placed injection blown rubber in the forefoot for extra cushioning, responsiveness, and to keep the shoe light. Overall, it provides you with good stability and a smoother transition from heel-strike to toe-off. The forefoot of this running shoes are also well segmented and consist of many rubber lugs and flex grooves. They should provide a similar amount of flexibility in that area. 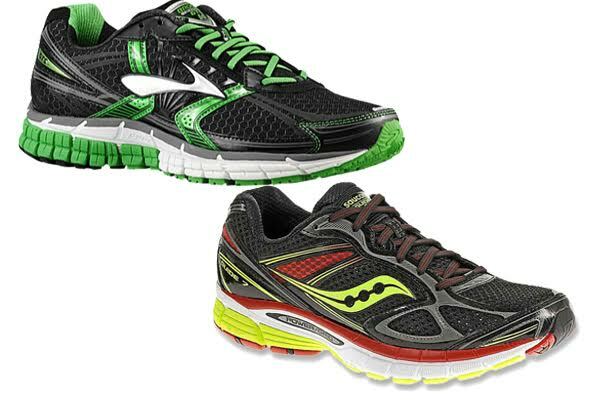 The Saucony Guide 7 and the Brooks Adrenaline GTS 14 fall in the same category of stability shoes, but the Saucony is considered a light stability or guidance shoe. Brooks Adrenaline GTS14 is a good running shoe for flat feet while Saucony Guide 7 is a good running shoes for race or long distance running. But, if you want shoes with plenty of cushioning, we think that you will prefer to choose Saucony Guide 7 because, you can not find it on the Brooks Adrenaline GTS14 which actually it has less cushion than previous models and a little too tight of a fit shoe.